Heeft u een vraag voor Hotel Shreenithi? Tijdens uw bezoek aan Madurai zult u zich snel thuisvoelen in Hotel Shreenithi, dankzij de hoge kwaliteit en de goede service. Slechts 3.00 Km verwijderd van het stadscentrum, is dit een goede plek voor gasten om te genieten van de attracties en activiteiten in de stad. Dankzij de praktische locatie liggen alle belangrijke trekpleisters in de buurt van het hotel. Profiteer van de ongeëvenaarde dienstverlening en voorzieningen in dit hotel in Madurai. Maak in het hotel gebruik van een selectie topklasse faciliteiten, zoals 24-uur roomservice, 24-uur receptie, faciliteiten voor mindervaliden, snel in- en uitchecken, bagageopslag. De ambiance van het Hotel Shreenithi weerspiegelt zich in de inrichting van de kamers. plasma tv, rookvrije kamers, airconditioning, bureau, ventilator zijn slechts enkele van de faciliteiten die u ter beschikking staan. Daarnaast garanderen de talrijke recreatieve mogelijkheden dat u zich tijdens uw verblijf kunt vermaken in het hotel. Wat de reden van uw bezoek aan Madurai ook is, het Hotel Shreenithi is de perfecte keuze voor een enerverende vakantie. I stayed there for a night, the room was clean and good. The only trouble I had was there was no TV connection in my room. the TV socket was left open and it is quite dangerous as it is a live wire. I asked the hotel staff to check on it, but nobody came to fix it. I had to leave next day so I ignored it. the hotel is located bit away from the city and bit away from madurai meenakshi temple. Overall decent stay, could have been better. I booked 2 Rooms (with 1 extra bed) for One day(Sat 12-Sun 12) at saturday(same day), since i need room for sunday morning refreshment and placing luggage. We reached by 6'o clock and i told them i booked in online for so and so name. Immediately the person in reception told, we don't have any rooms now. i told them i booked for complete night and we didn't get any information about that. He told like we informed OYO that no rooms available like that. Then i informed them that i booked through Agoda. Then he checked his diary and system and told the same story that no rooms available. He didn't care about our booking. I'm not in a situation to argue or make call to agoda to enquire about that, and we are totally 5 including my aged mother and father. Finally he agreed to give single family room. 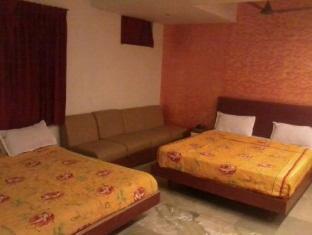 Though its quite inconvenience for us to share the same room for 5 to get some sleep. When we arrived at the hotel, the management didn't even know that we booked and paid. When we got into our rooms, the bedsheet was very dirty and the shower was not working. After they repaired the shower, there was no hot water and the water was dirty. Very bad room service. The hotel is quiet far away from the town area. Plus there's no shops nearby to buy even mineral water nearby. If you're going to stay there will small kids or elderly people, its best not to stay here. It is a basic hotel - but it's exceptionally affordable. The centre of town is a bit far - it requires a 15min auto rickshaw ride. Generally happy with the facilities and service. The staff were very rude to me on arrival and on departure. I am a female travelling on my own through india and arrived at madurai train station earlier than originally expected. This meant that i got to the hotel t arnd 6am. The staff were very unhappy about this and made it clear to me almost shouting at me for confirmation email and passport. My hotel confirmation was in my emails and the hotel did not have wifi but it was like they did not understand this and kept demanding it even though my booking was in their records and my passport proved my identity. Not a nice experience and i wanted to leave straight away. The day I had to leave they called my room at 6am demanding I check-out. I told them I was still asleep and could i have an hour or so extra as I had not even packed. THis was refused again with the staff member shouting at me....not a nice way to wake up. I really dont see what difference it would make to allow me some time to wake up and pack. The room itself was fine but the sheets were dirty and had holes in. it was nice to have hot water and tv with english channels but the staff need to work on their hospitality skills - very rude and i wish i had never stayed there. It is also quite far away from Madurai city. 1.behaviour of hotel staffs and service is very good.2.rooms and location of the hotel.3.hotel car service is superb. I booked this hotel through agoda.hotel location is very good.madurai bus stand is 2km ddistanc Max and menakhshi temple is 4 to 5km distance.they provide pick up and drop service and I must say it's awesom.rooms are excilent.